Residents in the town of Lizton are frustrated after a bus company said they wouldn't pick up kids on a road due to the road conditions. LIZTON — Residents on one road in Lizton hope the town will find a permanent fix after a bus company said kids would have to be picked up at another location due to the poor road conditions. Neighbors who live along Stillmeadow Drive said they were shocked when they found a letter in their mailboxes on Friday stating Edwards Bus Company would pick kids up on US-136 instead of their usual stops. The letter stated this was because the conditions on Stillmeadow Drive were so bad. "Obviously I was pretty upset because this isn't exactly the best place to get kids on and off the bus," Kristie Donald, who has a fifth grader who rides the bus, said. 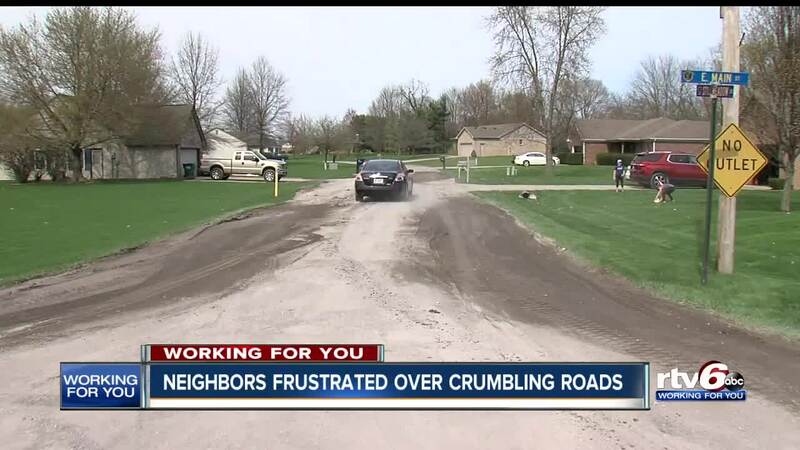 "I know the people in the back of the neighborhood aren't happy about having to drive through all the potholes several times to get their kids on and off the bus." When RTV6 arrived to check out the road conditions, Steve Edwards from Edwards' Bus Company was there fixing the road himself. He told RTV6 off-camera he was fixing the potholes so the bus would be able to pick kids up at their usual stops next week. Residents hope town leaders will see the safety of children was almost compromised and will work to permanently fix the road. That permanent fix will be thanks to 'The Community Crossing Grant,' awarded to the town earlier this year. It will allow for the resurfacing of four different roads, including Stillmeadow, in 2019.